These 6 strongest engine friction reducing products are the strongest, fastest acting products made. A quick install returns lost power, ends wear, growl, and tap noise, stops the worst friction negative known - metal migration. This product is added to new and rebuilt motors, transmissions, power steering units, compressors and industrial machines of all sizes - besides all types of new and worn engines. Add the red bottle to the fuel as a complete free system cleaner, if installed to help a fuel-powered motor displaying a friction-causing problem like growl, excessive heating, tap, or high mileage wear, or break-in tightness. Add the yellow product to any air intakes with a vacuum source to free and clean the air intake, idle adjusting system combustion area, spark plugs, sensors, and catalytic converters. Add the 3rd item; a black container in that package to the motor oil. Run the vehicle or machine as normal for 15 minutes to work the product ingredients deep into the recesses of the motor. Drive for a week as normal to permit full penetration of the ingredients and for proper cleaning of the upper portion of the motor. A week later, proceed with the remaining three items as follows. 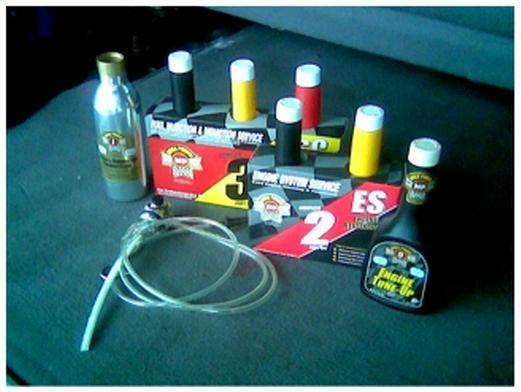 Add the second yellow bottle contents to the motor oil. Run the motor for 5 to 10 minutes. Stop motor and drain and replace the old oil and filter with new. To the new oil, add the two remaining products. That completes the friction reducing treatment. Performance improvement will be noticed immediately. These friction reducing products will continue to reduce engine friction and clean to the lowest level reasonable for return to top efficiency. 6 item treatment. $90 total. Includes phone help at installation if needed. Delivered, by Fedex. [The metal container and the hose attachment is a automatic feeder device mechanics or anyone can purchase if performing this treatment on a regular basis. Its purpose to automatically feed the second ingredient into the upper part of the motor automatically. Not needed for a single installation. It is a time saver. $125]. Call me... george 512 665 2288 day or evening. Learn more.